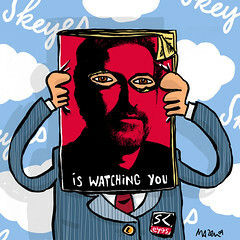 this drawing is about "SK Eyes", the new "brand/concept" launched by the samir kassir foundation. We have an English language discussion list..UNQUALIFIED support for the Palestinian right of return is required for membership. We hope to facilitate contact with people outside the Arab community. We were originally Irish AMericans, and are now half Arab out of 320, making us one of the largest lists of this type, and the only one in English that I know of that isn't infected with 'liberal' zionists. Let me know (mhiver@earthlink.net) if you/friends would like to participate!